“that’s the fun part about science: there are always mysteries to unravel.” (Page 123). Sophie grew up in a world where electronics were readily available and her failed science experiments were continuously cleaned up by her father. After destroying the science fair and her chances of getting into a top school like MIT, Soap accepts her application to the Mechanical Science Institute in small town Bugswallow, Minnesota. Her cousin, Dean is waiting to meet her there, as he just accepted a position as dean of the Institute, even though he’s really only a fireman. There’s more than simply hidden labs and secret inventions afoot at the Institute, there are thugs and evil scientists who want to take the Institute’s secrets and use them for nefarious and evil purposes. It is up to Soap and Dean to stop the unknown ‘Professor’ from stopping the world as we know it. Soap was so naïve it was cute. It was only through her ineptitude with the real world that the plot was able to proceed as it did. She allowed the bad guys to implicate her father, to get inside the Institute, and almost shut down the security systems for the entire building. Thankfully, her stupidity stopped her there. Tower almost took her naivety too far, but it is still barely believable. She’s only 16, though she is a genius, she has never really been involved in something nefarious and has no reason not to trust others. Soap is also adorably ignorant of social norms and her thought processes as she attempts to mimic normal interactions is hilarious. She creates charts to help her fit in, but of course, they don’t. Soap is like the girl version of a super nerd boy who can’t talk to boys. Or girls. She only fits in with other super science geniuses like those at the Mechanical Science Institute. The villain and thugs were just short of being too stereotypical. Though it was easy to guess who the mysterious “professor” was behind the evil plans, I enjoyed how the plot thickened and the pacing quickened toward the end. I really ejoyed Tower’s writing style. It was concise and witty and I loved Soap’s POV. I didn’t mind Dean’s POV and enjoyed the intertwining of the action between their two viewpoints. 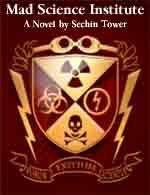 This novel was published by Siege Tower Entertainment on December 9th, 2011 and is available on Amazon here. ← Wrote a book and need reviews but don’t know how?